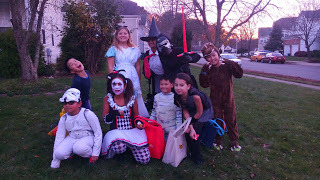 Anyways, I started trick-or-treating at around 3:30. As you very well know, I was Kylo Ren and my little brother Onur was Yoda. At first, we went with my neighbor Young. He had to go to church later on, so we didn't get to collect much candy with him. Besides, it was so early that most people weren't home from work and school yet! (Except for us, since MMMS ends at 2:30 and we are home by 2:40 or 2:45.) After Young left, I joined Neel and a few other kids on the street to go around the block. We did this for about a half-hour. I have no photos of this part. 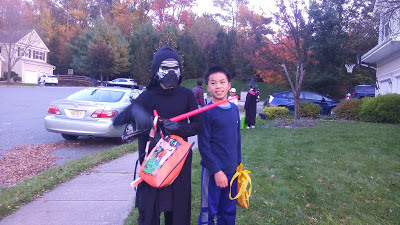 Near 5 PM, my dad drove me to the street where Xiang and his group had started trick-or-treating. We collected more kids along the way. Most of the kids were people I knew from Defino. I was impressed at how Xiang had managed to gather up so many of them! However, Onur was not with us during this time. He preferred to go with his own friends. Now, I guess you technically would call the list of kids "plagiarising" from Xiang's blog. But since I am citing the source, this technically wouldn't be true. Together we went around most of the neighborhood, and I got really tired along the way. My candy bag was overflowing. My arms and legs were very tired. So after 2 hours, I went home. So that was a summary of what I did. Now I will show you some photos and captions. This is me standing next to Xiang. This was after Xiang's costume of Bill Cipher (from Gravity Falls, which is pretty obvious if you have seen my old posts is that I am a HUGE fan of the show) got ripped. 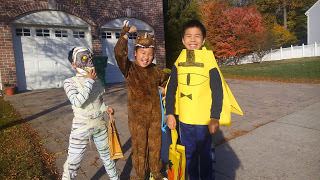 This is Xiang;s little brother Liang as a mummy, Kevin as a dinosaur, and Xiang as Bill Cipher all standing together in a photo. I have to say, Xiang's homemade Bill Cipher costume was very good! Too bad that it got destroyed after a malfunction. Well, that sums up the trick-or-treating part of this post. Wait aren't I forgetting something? Oh yeah, I promised you in my Happy Halloween post that I would make a post showcasing the new AABO Show YouTube channel vlog about a Haunted Hayride. It has been over a week since I uploaded it, so it would be best to show it to you now! I made two new videos about the hayride: One of which was a highlights reel and another one of which was the full video. The higlights reel is slightly over a minute long and so is the video itself, so it isn't as time consuming as most of our other vlogs. I hope you enjoyed this post. Share it with others, Remember, we have until Thanksgiving for me to reach 20 thousand views! See you next time!!!! BBBBYYYYEEEE!!!! !